If you are looking for tips on how to choose a trampoline, then you are in the right place. There are several mistakes that people make when they buy their first trampoline which often results in them having to spend more money to fix the problem! If you do a little research beforehand, you can avoid these mistakes and that will likely keep more money in your pocket, ensure those who are using the trampoline are safe and everyone will have fun! 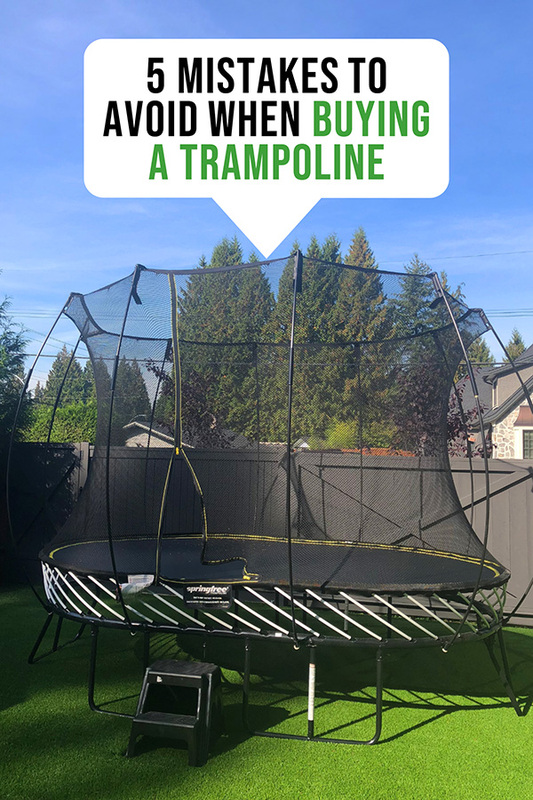 There are a few common mistakes people make when they buy a trampoline, keep reading and you will quickly find out how to choose a trampoline and avoid these issues! Tips on how to choose a trampoline and mistakes to avoid before your trampoline purchase! When you are planning on adding a trampoline to your backyard, bigger is NOT always better. If you have limited space, a trampoline that is too big will either hit trees, or your deck or other obstacles. This can cause the trampoline enclosure to be damaged, or can create hazards around your trampoline. For more basic safety tips, read the guide to trampoline safety tips. When you are considering a trampoline, measure your yard width and depth and check it with the trampoline size, not just the mat size. 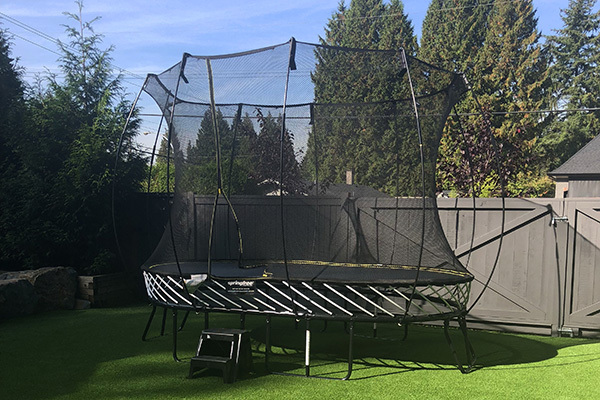 If you are limited in space, you can choose an oval trampoline or one from Springfree where the springs are under the trampoline making it smaller in diameter than other trampolines! Enclosures are recommended by health professionals and trampoline manufacturers. They will almost eliminate fall injuries from children being bounced off the trampoline. Many also ensure that those who are jumping are not able to get caught in the springs. 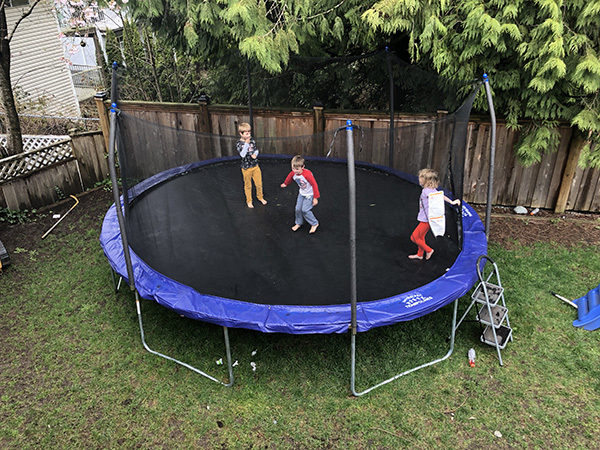 When you are researching the best trampoline for your family, consider how the enclosure is attached to the trampoline and whether it is attached to the mat or to the outside. Trampolines are not designed to last forever. Nothing these days is meant to last, but if you do not want a giant eyesore in the backyard after a few seasons, ensure the trampoline you buy has spare parts available from the manufacturer. The easiest way to do this is to google the brand and check for a website and parts list. After you receive your trampoline, keep a copy of the instruction manual with the brand and parts list so you can easily get replacements if you need them in the future! While trampolines are recommended for one jumper at a time to prevent injuries, the reality is that kids like to jump together. If you add a few teenagers, the weight can jump up FAST. For a trampoline not designed for high weight limits, this can mean a sagging mat and overstretched springs. When you are investing in a quality trampoline, keep this in mind. It is also important to winterize your trampoline if you live in an area that gets snow. Snow can be extremely heavy and can damage the springs and mat! Some trampolines also require you to purchase the ladder separately. A few extra minutes of research will ensure you are not frustrated when you are installing your trampoline! Other popular accessories for trampolines are trampoline bounce boards. Hopefully this guide has given you some things to consider when buying a trampoline. I am also often asked when the best time to buy a trampoline is. If you want to read a full review of these models and more before you purchase your trampoline, check out this Trampoline Buying Guide.